Amsterdam is amongst Europe’s largest and most important dry bulk ports. Major international companies, including agri multinational Cargill, steel giant Tata and coal transshipment companies Rietlanden Terminals and Amsterdam Bulk Terminal (OBA) are proud to call Amsterdam their home. Thanks to these companies,Amsterdam has become a major dry bulk hub serving northwest Europe. In the North West European bulk sector there are two main ports that are able to reach a wide hinterland via waterways and barges — Amsterdam and Rotterdam. These two largest Dutch ports have the advantage that, for bulk cargoes, barge is the cheapest method of transport. That’s why Amsterdam and Rotterdam together get 51% of the dry bulk cargo shipped via ports in the Hamburg-Le Havre range (59% including liquid bulk). As world’s largest gasoline port and second-largest coal port in Europe, Amsterdam is a leading player in the fossil energy market. Due to its position within the coal market, dry bulk throughput counts for 43% of the port’s total annual throughput. Next to coal,Amsterdam is a top notch player as regards to a different type of dry bulk good, that is cocoa. Amsterdam is the world’s #1 cocoa port. Sustainability and support of fair trade initiatives remain of the utmost importance to Port of Amsterdam with regard to cocoa and other soft commodities passing through the port. A cocoa ‘rail-shuttle’ between Amsterdam and Berlin has already been realized, reducing road congestion and CO2 emissions in the supply chain. the port of Amsterdam. The terminal, situated on a 25,000m2 plot with 190m quay will be utilized for storage and transshipment of ferro-metals. The annual deep sea-related transshipment via the AST-terminal is forecast to be more than 250,000 tonnes. The Port of Amsterdam is currently handling about 710,000 tonnes of scrap. industrial mineral processing and oil seeds crushing.All made possible by the companies in the port. The 18% growth in 2013 in agribulk in Amsterdam can mostly be attributed to the biggest agribulk terminal of Europe Igma, while the growth in industrial minerals is due to the investments of Mondo Minerals and new business at the Waterland ‘all-weather’ Terminal. Agribulk is playing an increasing role in the energy market. For example, soybeans and oilseed are an important feedstock for the production of biodiesel. Grain and maize are deployed for the production of bio-ethanol. As one of the world’s largest energy ports, Amsterdam also wants to play a prominent role in these supply chains. The port has also forged a unique role in the agribulk trades by encouraging the handling of parcel services by the likes of Cargill. This system enables smaller volumes to be transported without impacting the economies of scale of shipping in bulk because a number of cargo owners can use the same ship and storage facilities simultaneously. Port managers worked diligently with stevedores and shippers to ensure the complex logistics entailed in this type of shipping was facilitated across the port, with every detail covered including tariffs, storage facilities and the handling systems used before shipment to the hinterland. More important: renewable energy needs a strong position within the sector mineral energy, but also agribulk and recycling. These are precisely the cornerstones on which the port of Amsterdam excels. It has the infrastructure, knowledge and channels which play an important role in the transition. It is these strong fundamental sectors which make the port appealing for bio-based economy. Bio-based economy in the Port of Amsterdam revolves around the production of high-quality raw materials extracted from organic base and residual flows. Port of Amsterdam reserves space and invests in partnerships to develop bio based activities in the port, all the while directing towards synergy. Generating clusters and cycles, in which the residual flows of one company are the raw materials of another and local and regional waste are processed into raw materials and energy. As a true and renowned energy port, Amsterdam offers wide- ranging possibilities for the transshipment, storage and processing of biomass. Biomass refers to the biodegradable fraction of agricultural crops, agricultural, forestry and similar residues, and waste. It is used as fuel for power stations. Due to its extensive experience and expertise in the transshipment of coal and agribulk, combined with its excellent connections to the European hinterland, Amsterdam is the European hub for this new energy commodity. The Port of Amsterdam is the rising star amongst European ports when it comes to biomass. The Supramax bulk carrier Egret Bulker, sailing from Vancouver, Canada, arrived at the Amsterdam terminal carrying 47,000 tonnes of wood pellets. A single shipment of biomass of this volume was something new in the port of Amsterdam but posed no problem for the vastly experienced and capable stevedore. Recently a new contract was signed with a biomass fuelled midscale power plant that will generate green power in the port of Amsterdam. The plant will be in operation within two years. Furthermore torrefaction plants could be established in the coming years. Up to 1mt of biomass is expected to flow through Amsterdam by 2020. The annual throughput of biomass in the port of Amsterdam numbers varies between 50,000 and 250,000 tonnes in the recent years. To facilitate expected growth in the market, Port of Amsterdam and the terminals are preparing to invest in several new ambitious projects for storage. Of course, actual developments are dependent on government policy. The year 2013 got off to a promising start. Based on the figures for the first half of the year, Port of Amsterdam expects to be able to end 2013 in reasonably positive territory. Working in cooperation with partners and customers to further optimize and intensify port activities with a view to sustaining this growth. The estimate for the dry bulk sector in 2013 is very good with a growth of 11% to 33.6mt. Agribulk is estimated to grow by 18%, while the coal import is expected to rise by 14% more throughput, a record. The drivers are the closing of coalmines in Germany, a fairly cold year, low coal prices, high gas prices in Germany. This is a return on investments made the in the past years by the terminals OBA, Rietlanden and the Port of Amsterdam in port infrastructure and equipment. Today, Amsterdam is aiming to reach 50mt of dry bulk transshipment by 2020, a goal to be achieved without use of extra land area. Port of Amsterdam’s ambition is to use the existing terminals more effectively and efficiently to increasing cargo throughput in an innovative and sustainable manner. Growth of course entails more fully loaded Capesize vessels calling at the port of Amsterdam. Global development shows that vessels are increasing in scale. To cope with the larger amount — and the increased size — of vessels, new sea locks and a lightering dock outside the sea locks in IJmuiden will be developed. Port of Amsterdam is participating in these preparations in association with the Dutch Ministry of Infrastructure and the Environment, the Directorate-General for Mobility and Transport, the Directorate-General for Public Works and Water Management, the City of Amsterdam and the Province of North Holland. The Municipality of Velsen is closely involved in this project due to the intended location of this new lock. After the administrative decision-making has been finalized, expected in 2015, construction will begin and when completed by 2019 the new sea lock will replace the Noordersluis ‘Big Lock’ whose life span comes to an end in 2029. The regenerated dock will provide an extra lightering facility that can accommodate two Capesize bulk vessels, transporting liquid and dry bulk cargoes such as oil products, bio-fuels coal and biomass. Summarizing, the port of Amsterdam is growing and ambitious. Goals however can only be achieved by working together, by being a port of partnerships. Being a port of partnerships involves working together with inspiring partners, including the port business community, competitors, research and educational institutions, and governments, at the regional, national and international levels. They believe this is the only way to increase value and sustain growth. As an independent port company, Port of Amsterdam has more opportunities for different types of partnerships, allowing to operate more easily, flexibly and intelligently as a link in the logistics supply chain. This helps to support the customers and strengthen both the port and the environment. Being the fourth port in Western Europe and a dedicated bulk hub, Amsterdam port is the reliable partner par excellence for dry bulk logistics across Europe. Rotterdam-based European Bulk Services (EBS) has given Dry Cargo International details of some of its most recent developments. NEW STORAGE SHED FULLY OPERATIONAL EBS has proudly unveiled its new storage shed at the Laurenshaven terminal. This new shed was built in nine months by construction firm Rasenberg. The concrete building, with a net volume of 30,000m3, consists of three 10,000m3 compartments. The new storage facility will be suitable for dry bulk products of all kinds. The roof will have movable steel hatches which can be opened and closed remotely by the crane operator. Due to an advanced safety system the grab cannot cause any damage to the walls of the shed. European Bulk Services is building a 65,000m3 storage shed at its Europoort terminal for a major client which wants to use the terminal as an agri-hub. A long-term contract has been signed which, from mid- 2014, will boost agribulk volume by around 1mt (million tonnes) a year, bringing a further rise in profitability and improving the product mix. The existing deep-water jetty will also be extended by the Port of Rotterdam. On this new jetty, which will accommodate vessels with a draught of up to 16 metres, EBS will install a new hopper and conveyor system linked to the existing conveyors. The existing train/truck loading station will be modified and extended. Completion of the new storage shed and related conveyors and extension of the train/truck loading station is expected in the first half of 2014. Construction of the new deep-water jetty is scheduled for completion in early 2015. European Bulk Services (EBS) B.V. is an internationally respected stevedoring company with a focus on the storage and transshipment of dry bulk goods. EBS has its own fleet of crane vessels. Approximately 180 full-time employees work for EBS, generating approximately €45 million in revenues per year. EBS is a wholly owned subsidiary of H.E.S. Beheer N.V.
hinterland by inland waters, railways and trucks by highways. The terminals can be reached without having to pass a single lock. All types of ships can be handled at these terminals, from Capesize to coastal and river barge. The Europoort terminal is one-and-a-half-hours’ sailing time to/from the pilot station and the St. Laurenshaven terminal is three hours’ sailing time to/from the pilot station. In order to meet the special requirements of the coal import market, EBS has invested in several (electro) magnet systems for cleaning contaminated coal with iron parts. The St. Laurenshaven terminal, with a depth of 13.85m, is perfectly equipped to handle and store, amongst others, coal from Russian load ports. These load ports have a similar maximum draught to the St. Laurenshaven. Receivers of Russian coals can be extra sure of the quality of their coal if their product is cleaned for metals via the EBS de- ironing installation. The electro magnets are installed in such a way that the coal can be cleaned either via storage or via board to board discharge operations. EBS strives to provide tailor-made services in consultation with its clients and offers: v transshipment of Capesize and Panamax carriers into coastal vessels and river barges by means of floating cranes and gantry grab cranes; v open and covered storage facilities; v blending facilities and weighing services; v excellent transshipment facilities via road river and sea; and v SKAL, USDA-NOP certificates and GMP+, BLU Code, ISPS and ISO certified administration procedures. As of now, OVET has a new state- of-the art train loading station available at its terminal in Vlissingen/ Flushing. This new piece of equipment will allow OVET to receive 44 wagon trains in one length. OVET handled 14 test trains for different (German) customers using different rail transport companies in August and September last year, with good results. A 24-hour round trip to e.g. the German Ruhr area has proven to be successful. The rail companies were very satisfied with the available good connections to the port of Vlissingen. The station has a maximum loading capacity of 1,500tph (tonnes per hour) and is equipped with an automatic weighing system. Over 1,250 metres of rail track is available at the terminal, of which 675 metres are double track. Besides the train loading OVET also offers de-ironing, blending, screening and crushing services. The port delivers excellent rail connections, rail paths and (diesel)shunting services. Different rail and (diesel) shunting companies (DB Schenker, Locon, Rheincargo, Captrain, RRF,TX Logistik) offer transport from and to the port, which can provide OVET with the necessary service. An electrified shunting yard is available at rail station Vlissingen-Sloe. With these facilities, OVET is capable of expanding coal rail transport towards the European hinterland, mainly to supply the German power and steel industry. Other dry bulk products can also be handled for all European destinations. The new facility is designed to give OVET maximum flexibility in terms of loading. Other loading equipment, such as mobile conveyor belts or cranes, can still be used to load different types of wagons with all kinds of dry bulk products. OVET operates two deep water terminals in Vlissingen with two Capesize berths and Terneuzen with a Panamax berth facility. With four floating cranes, Ovet offers a discharge capacity of 80,000 metric tonnes per day. Both locations are strategically located and have efficient hinterland connections. The advantage of the locations for rail transport is, that there is no congestion at all. The time needed to reach the German border is therefore very efficient. The rail network Zeeuwse lijn and Sloelijn connect the port of Vlissingen to the European hinterland. The rail lines are electrified and the port of Vlissingen has an electrified train yard. The rail track from the train yard to the OVET Terminal at Kalootharbour (approximately 5km) is non-electrified. Transport on this track is done by means of diesel shunting locomotives. Different shunting companies, amongst others Locon, DB Schenker and RRF are present in the port. With these new facilities OVET is ready for the future. They also enable OVET to be present in the market on different fronts. EMO hits a new dry bulk discharge record in early January — the billionth tonne of dry bulk. A milestone for Europe’s largest dry bulk terminal. Forty years ago, EMO unloaded its first tonne of iron ore (November 28th 1973). Now the terminal has reached the billion tonne mark. The honour goes to the Vale China. The Vale China, with its 375,000 tonnes of iron ore, is one of the largest dry bulk vessels in the world. The vessel is 362 metres long, 65 metres at the beam, and has a draught of 23 metres. Using three 85-tonne grab unloaders, it takes approximately four days to unload the Vale China. Thanks to EMO’s unloading capacity and draught meant that its terminal was an ideal destination for this huge bulk vessel. In order to further strengthen its position in the Rotterdam Rijnmond area and keep on serving its customers in a modern and professional way, there has been an extensive investment program at ZHD Stevedoring over the last two years. The Rotterdam based (family owned) private company with more than 45 years of stevedoring experience, is — even in these difficult market conditions within Europe — still working on a major investment to reclaim a further ten hectares of terminal area in close co-operation with the Rotterdam Port Authority. new-building of covered warehouses, with a capacity of approximately 50,000m3 — operational from August 2013. Although the start of 2013 was not easy due to the difficult market conditions, ZHD revealed at the end of 2013 that any decline in volumes at the beginning of the year had been offset and that annual throughput would be approximately 7mt (million tonnes), the same as 2012. This achievement is due to ZHD’s investments, the wide variety of products handled and (new) markets (e.g. agribulk), as well as to the company’s flexibility and ability to adapt quickly to changing markets. ZHD expects to maintain this volume for next year. As of 1 July 2011 the municipality of Dordrecht and the Rotterdam Port Authorities entered into an agreement to join forces, an agreement which was formalized in January 2012. As of that date (officially) the Port of Dordrecht has become an integral part of the Port of Rotterdam with all its benefits. Although being active in Rotterdam for many years, by means of its self-propelled floating cranes, ZHD Stevedoring recognizes the advantages being part of The Port of Rotterdam. In close co-operation with the Rotterdam Port Authorities, ZHD Stevedoring is looking into possibilities and has started the negotiations to reclaim a further ten hectares of land adjacent to its terminal in Dordrecht. This ten hectares will be connected directly to the water with a new 750m quay wall with 9.45m draught, able to accommodate vessels up to approximately 40,000 tonnes. ZHD expects to announce a positive outcome of these negotiations in the first quarter of 2014, at which point the preparation and construction of this huge project can be started. Apart from handling products like minerals, coal, petcokes and seasonal products as salt, ZHD Stevedoring has been focusing on handling and storage in niche markets such as steel-scrap, biomass (woodpellets) and waste-materials. From the 1 January 2013 ZHD has also been GMP+ certified, giving it the chance to play its part in the transshipment of agricultural products. Special services are offered in the field of breakbulk and the handling of bulk in/from containers (a.o. minerals, scrap) — a global trend which will grow in the future — are not unfamiliar to ZHD Stevedoring and complete the handling portfolio of the stevedore. With its steel terminal in Moerdijk, ZHD performs handling of coils as well as other steel products, such as wire-rods, steel bundles, etc. Rotterdam-based ZHD Stevedoring is a family owned, private company with more than 45 years of stevedoring experience. ZHD is active in the total so-called Rotterdam-Rijnmond area, with terminals in Dordrecht and Moerdijk, but also with its (self- propelled) floating cranes in Rotterdam. The company offers services in bulk, neo bulk, steel products, coils and container handling, including warehousing and storage (open, covered and floating). ZHD has both road mobile and floating equipment and is able to handle all kind of product. All ZHD terminals are able to work round the clock (24/7) and are ISO and ISPS certified. Furthermore, ZHD also has water-related sites available for further (industrial) development. Typically, Nemag’s average customer is a big terminal — whether it is a steel plant, power station or stevedoring company. The terminal is likely to have a high berth occupancy, and Nemag’s grabs are used on cranes ranging in size from medium to very large. About 80% of the cargo flow worldwide comprises either coal or iron ore, and Nemag’s customer base reflects this fact — approximately the same percentage of its grabs are sold for use handling coal or iron ore, in the steel or energy market segments. The remaining 20% of its grabs are used to handle grain, animalfeed, scrap metal, minerals, biomass, fertilizer, agribulks and more. Nemag strives to keep ahead of the game, so it invests significant sums in research and development. One of its most interesting recent innovations is the introduction of a new, environmentally friendly clamshell grab. This model has a number of new features, and is already selling very well. The grab has proved to be popular not only with existing Nemag customers, but also with other users who were previously loyal to other brands of grab. Nemag continuously explores ways to make its grabs as efficient as possible. The latest development is its new range of enclosed type clamshell grabs, which set new standards in environmentally friendly bulk handling. This range of clamshell grabs has a new revolutionary shape of the shells and also includes a number of innovations, which reduce spillage. Shells of conventional clamshell grabs are mostly designed with square corners, which are reinforced by means of extra strip plates and lots of welds at the shell’s corners. Square corners wear out fast and also cause damage to ships and to product degradation. Also, square corners at the lip plates, wear out fast and will result in spillage of material from the grab. rounded corners, inclusive of the upper part of the shells. This rounded design minimizes the risk of damage to the ship’s holds. Further, the extremely flushed design of the shells minimizes residual cargo on the grab construction and reduces spillage drastically. Also, the grab has a better efficiency when digging in to the material because of balanced geometry. This leads to a faster emptying over the bunker and reduced cycle time. The cold forming of the shells avoids degradation of wear-resistant steel. The folded shell construction is extremely stable and wear and tear in the ‘corners’ will be minimized, resulting in improved lifespan of the grab (especially important when handling abrasive materials). Secondly, the position of the welds is moved away from the corners and result in a substantially longer life span of the grab shells. Furthermore, the number of welds in the shells has been reduced drastically; this leads to significant lower welding heat input in the wear-resistant material of the shells. The new clamshell design also offers new possibilities to increase strength of the grab in combination with same or even lower dead weight of the grab. First successful deliveries have been made to various European customers including Terex Germany, EON UK, OBA Amsterdam, Dong Energy India and ZHD in The Netherlands for the handling of steam coal, wood pellets and alumina in capacities of up to 50-tonne SWL (safe working load). scissors grab: this is specifically suited for the large-scale handling of coal, ore, minerals, biomass, wood chips, concentrates, bauxite, but also for sticky coal and ore. High productivity, long life span and low maintenance costs are guaranteed under almost all working conditions. clamshell grab: for reliable and fast handling of many different bulk goods, Nemag developed the clamshell grab. This grab makes it possible to discharge practically every kind of bulk material, as long as it isn’t too coarse: coal, ore, minerals, biomass, concentrates, fertilizer, bauxite and phosphates. trimming grab: this is particularly suited to the handling of heavy and course materials, such as rocks, manganese ore and pig iron. Its extremely favourable digging capabilities for heavy and coarse materials make the trimming grab very productive. cactus grab: this can specifically be used to handle shredded scrap, biomass and rocks, but also for wood chips and household waste. The cactus grab is a reliable partner with a strong reputation. Quick Release Link: with this, it is possible to change the largest grab in a mere few minutes. Rope Pear Socket: this is a strong connection to attach to steel wire ropes, forming a strong connection for attaching other wire ropes and chains. The Rope Pear Socket is often used in combination with the quick release link, but is also used in many other combinations. Nemag ensures that all of its products are as up-to-date as possible, and it is continuously carrying out research and investing in all kinds of production technologies, engineering software and so forth. Currently, the company is working in close co-operation with the University of Delft on a research project. It also has other technological developments in the pipeline. Nemag has been in the business for a very long time — it will celebrate its 90th anniversary in 2014. As a company, it believes in long-term growth, rather than short, unsustainable bursts of growth. This approach has enabled it to make sure and steady progress in the marketplace, and to do the very best it can for its customer base. Nemag anticipates that it will continue with its sure and steady progress, and also expects that the cautious optimism that is creeping into the market will be positive for the company as a whole. Chris Geijs and Jaap P.J. Ruijgrok, ESI Eurosilo BV, the Netherlands, take a look at fertilizer storage with help of the Eurosilo® system. With a history of over 40 years and a track record of more than 120 units built around the world, ESI Eurosilo is a major engineering and contracting company in enclosed storage and handling systems for storing huge quantities of bulk solids to meet the high demand for energy and mineral resources. Non- free-flowing products can be stored over longer periods of time with help of a slotted column system for uncomplicated reclaiming. Gypsum is stored this way at numerous power stations around the world. The same system is also a well- proven storage solution for solid fertilizer in granulated form like ammonium sulphate, potash and common salt. A recent example of fertilizer storage is the commissioning of a 40,000m3 ammonium sulphate silo in Seoul for the Capro Cooperation in South-Korea. During the filling process, the product enters the silo through a hopper mounted in the centre of the roof. A short conveyor transfers the bulk material to the telescopic chute. From here, the product can freely drop down towards the auger frame, located at the top surface of the already stored bulk material. An auger conveys the material to the outer edge of the silo. At this point, a sensor is activated, allowing the overhead bridge and suspended auger frame to rotate towards free space and lay down a new segment of bulk material. This process continues for 360°. The winch system (located at the overhead bridge) hoists the auger frame one layer thickness after completing a full rotation. This cycle can be repeated until the silo is completely filled with bulk material. During the discharge process, overhead bridge and suspended auger frame rotate continuously, while two augers dig into the bulk material and transport the product towards the slotted column in the center of the silo. After a full rotation, the auger frame is lowered one layer thickness. Propellers, located at the end of the augers, push the bulk material along the slots of the column, allowing the product to freely fall down towards an extracting device at the bottom of the silo. Ammonium sulphate in granulated form is an inorganic salt and mostly used as a soil fertilizer. In the soil, the ammonium ion is released, lowering the pH balance of the soil, while contributing essential nitrogen for plant growth. Most of the ammonium sulphate is produced as a byproduct during the production of caprolactam. After production, the ammonium sulphate acts like a free-flowing product with low yield strength under pressure. Ammonium sulphate is a hygroscopic bulk material and crystallizes at room temperature during storage. This process greatly increases the initial yield strength and can impose bridging problems during discharging after a period of storage in a mass flow silo. The slotted column design of the Eurosilo® system ensures stable storage of the initial low yield strength product and eliminates possible block-ups during discharging after longer periods of storage with help of the digging action of the augers and transportation of the bulk material along the slots by the propellers. The structural design of most Eurosilo® walls for fertilizer storage consists of a steel structure with an inner and outer wall. The inner wall consists of wooden planks, connected by tongue and groove. These planks are supported by horizontal ring beams, which take care of the bulk material forces. In the lower section of the silo wall, the ring beams are placed closer together, because of the higher bulk material forces in this region. The ring beams are connected to the vertical columns by means of a sliding joint. Due to this connection, all horizontal bulk material forces are taken by the ring beams as a tensional force. The ring beams can expand without transferring horizontal forces towards the vertical columns. This flexible wall system is well proven and corrosion resistant. The silo wall can also be constructed as a concrete structure. In this case, the horizontal bulk forces are taken by the reinforcement. Construction is done with help of a slip form, a method of vertically extruding a reinforced concrete section in a continuous process. The Eurosilo® system combines minimum space requirements with large storage capacities. In many cases, existing chemical plants need to expand their storage capacity. Very often however, there is not much space left for the installation of such a new storage system. Enclosed storage with the Eurosilo® system is very space efficient. Approximately one-third of space is used compared with open storage or a storage shed. The different components of the Eurosilo® system were part of a turnkey delivery on site. A temporary opening in the steel wall structure provided access to the silo. With the help of a mobile crane, all the components were hoisted into place, after which the construction of the roof was started. The first product entered the silo in the second quarter of 2013. It can be concluded that this type of storage is feasible for fertilizer products in a wide variety of situations in which the logistics require substantial storage capabilities. Comparing the total annual costs of silos equipped with the Eurosilo® system, consisting of capital, maintenance and operating costs, with those of storage in A-frame sheds or even open storage, these mammoth silos are favourable in many cases. Since 1973, the EMO terminal in the Rotterdam Port has been a major hub in transporting coal and iron ore from all over the world to the European hinterland. EMO has always been a reliable partner for its customers in helping to control these flows of goods by combining daily processes with a clear vision for the future. EMO is able to accommodate the world’s largest dry bulk vessels, and yet it never ceases to look to the future and plan ahead — now more than ever. In 2012, the terminal significantly increased its storage and transshipment capacity and efficiency by commissioning five new, state-of-the-art projects: its seventh stacker reclaimer, fifth unloader, a second fully automated coal wagon loader, a brand-new sea going vessel loader along an innovative, new quay, and a high-tech operations centre. These projects ensure that EMO is fully equipped to enhance its safety, efficiency and sustainability performance, and to continue to serve its customers as a reliable partner in dry bulk transshipment in the coming decades. EMO operates 24 hours a day, seven days a week. It handles large bulk shipments; its discharge capacity is 47mt (million tonnes) and throughput capacity is 60mt. It always approaches its work and planning with the greatest care. EMO believes it is very important to remain state-of-the-art. Keeping the terminal state of the art as well as making necessary improvements is its key to serving its customers. EMO’s highly skilled trained personnel work closely together. Skilled employees working with innovative technology guarantee high quality, efficiency and sustainability. EMO’s 160-hectare area currently offers 7m of storage. 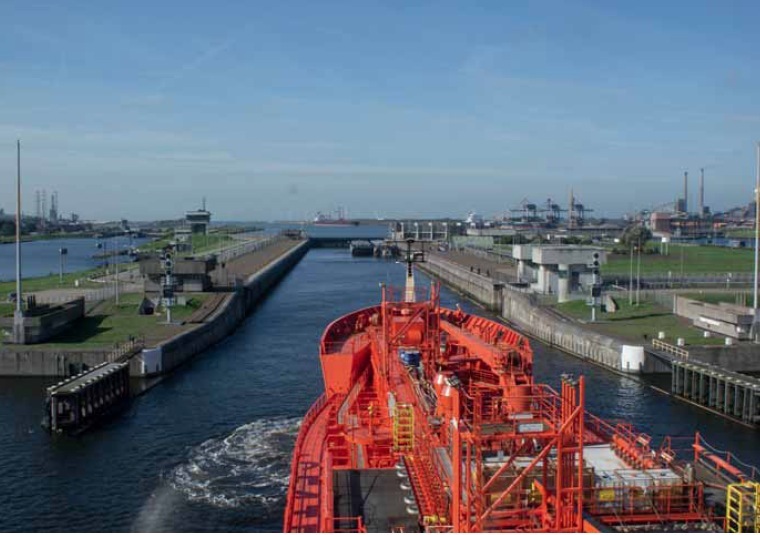 EMO is ideally located on a 23m-deep waterway connected directly to the North Sea. Rotterdam harbour has excellent rail and waterway connections to the rest of Europe. EMO is a partner that offers reliability and trustworthiness. The company stays on top of the latest developments in the market. EMO continually analyzes its customers’ needs, the quality of its services and its terminal’s performance. In anticipation of market trends and customer needs, it is continuously geared towards offering a more efficient, cleaner and safer terminal, one designed to meet all expectations.